OEM Dredge Equipment Company. Rentals and Sales. Rent or Buy Dredging Equipment Shown. How? The EDDY Pump’s open rotor design with high tolerances allow anything that will go into the intake to be passed through the discharge without issues. Tolerance between the rotor and the volute in the 4″ EDDY Pump easily allows the passage of a man’s arm, while the tolerance in a centrifugal pump is significantly less. In a 2-inch to 10-inch EDDY Pump the tolerance ranges from 1-9 inches. All Equipment Powered By EDDY Pump. Best Non-Clog and High Solids Industrial Pumps on the Market. 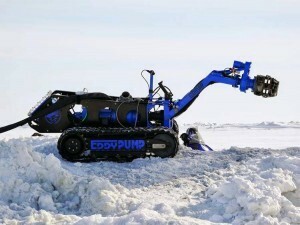 The EDDY Pump, USA Manufactured Since 1984. We are a Dredging Equipment and Pump Manufacturer. Rentals and Sales offered 619-258-7020. Call Our Engineers to Help Match the Right Dredging Solution for Your Project.